Singapore -- The tagline of the film goes, "How do you wake up from a nightmare if you are not asleep?" Good question. What is the answer? By waking up even further, even when awake. By first realising that the truth about anything might not be as apparent as you readily assume, that everything might not be what it seems. In other words, be more and more mindful, become more and more enlightened. "The Machinist" is a disturbing psychological thriller of the deviousness of self-rationalisation, which is magnified many times over when coupled with the delusional effects of insomnia. Christian Bale plays the title character Trevor Reznik, a machine operator who finds himself losing sleep and weight for over one year, for reasons he could not fathom. This was the result of the suppression of unpleasant memories due to denial. Screenwriter Scott Kosar said, "I had this image of a sleepless, intensely private individual trapped in his own personal hell." A moral precautionary tale about confusion, paranoia, guilt, anxiety, terror, grief, loneliness..., this film indeed has all the material for a personal living hell, as the entire world becomes a hellish conspiracy closing onto Reznik, as he imagines everyone as enemies trying to break him down. Like a postmodern hungry ghost starving of self-understanding and acceptance by others, Reznik "floats" through drab empty grey-scapes. His existence becomes less and less substantial through loss of mind and loss of matter - his weight! Questioning reality yet fooled by his delusions at the same time, he faces one of the most unnerving physical-mental existential crises ever portrayed on film. Said to have lost 29 kg for his role, Bale's shocking performance of unconscious self-torture depicts an increasingly emaciated man wasting away, reducing to mere skin and bones. As two characters remark in the film, "If you were any thinner, you wouldn't exist." 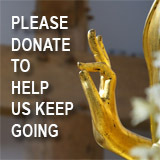 As a Buddhist movie-goer, his startling physique immediately calls to mind the image of the fasting Ascetic Gotama (the Buddha-to-be), with sunken eyes and protruding ribs and bones, who practised extreme asceticism for years, in the hope that experiencing suffering to the maximum will purge all negative karma, transcend suffering and bring on eternal bliss. But it did not work, as self-inflicted suffering is a closed loop of cause and effect that does not break us free from our ongoing existential suffering. Unlike the Ascetic Gotama though, Reznik was escaping the truth instead of looking for it. Carrying the burden of a dark secret, Reznik unwittingly blocked out the memory of being a hit-and-run driver. He did not realise that his unresolved guilt and denial concocted a disturbing mix of hallucinations, which led to a life of interaction with hallucinated characters. One of them even continually mocks him. Infuriated, Reznik struggles to track him down. He eventually "kills" him, before realising he was but a figment of his imagination, a manifestation of his inner demons. This is reminiscent of hell-beings whose relentless tormentors are actually manifestations of their guilt-ridden minds. Their punishment is essentially self-inflicted karmic punishment. Having forgotten what he wanted to forget, Reznik is desperate for rest and peace of mind he cannot find - simply because what unresolved was still unresolved. He could not close his physical eyes because he had closed his mind's eye on the terrible crime he was guilty of. The film suggests the unreliability of memories, of how we tend to twist and turn past events into the way we would rather perceive them. In fact, right now, to a certain extent, we see what we would rather see. Sounds like the material of nightmares? Well, that is how our mind works. The "delusion-index", which warps the glasses we look through at the world, differs in degrees for each of us. 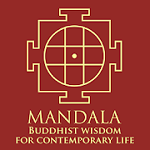 Only when this index hits zero, we see complete reality as it is, breaking free of all delusions... aka Enlightenment. Just when the audience sees Reznik steadily spiralling downwards into a deeper hell of sheer madness, he garners enough sanity to realise his misgivings, to surrender himself to reality, by turning himself in to the law. In the final scene of the well-lit pure white prison cell (or was it a mental asylum ward? ), as contrasted with the dreary darkness that pervaded the film, he lays back, grateful and redeemed. The restless has found rest at last, by the clearing of conscience. Since what we do not resolve will always haunt us in some unexpected way, why not openly face our demons now? Facing them on our deathbeds might prove too difficult and too late. 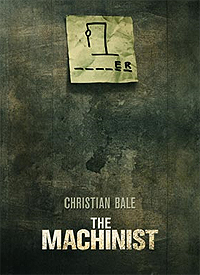 As the Director Brad Andersen puts it, "The Machinist is one of those classic stories in which a man goes out on a quest to solve a troubling mystery that ultimately leads back to himself." Yes, we are the machinists behind the mechanics of our own minds. Will you further tune your mind to make it right? Remember to use the tools of the Dharma!